It’s here! 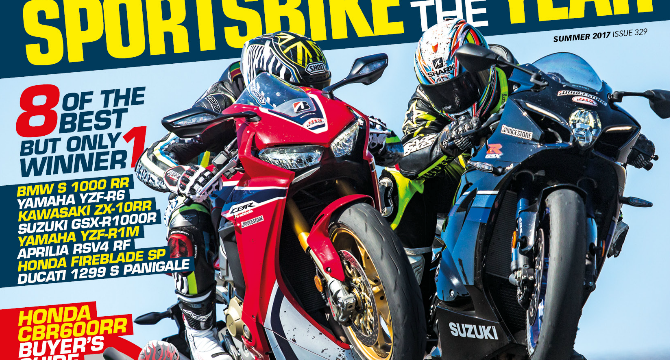 Finally, the UK’s biggest, best(est) and most important proddy Superbike test graces these pages! 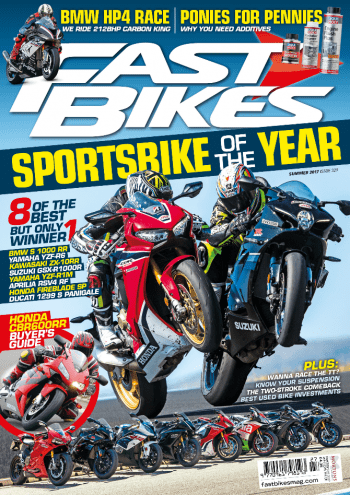 So, who won between the Aprilia RSV4 RF, BMW S 1000 RR, Yamaha R1M, Ducati 1299 Panigale S, Yamaha R6, Kawasaki ZX-10RR, Honda Fireblade SP & Suzuki GSX-R1000R? Find out right now! Not really our cup of tea, truth be told, but here it is anyway, another new R nineT! If the answer is ‘yes’, then we salute you, so we do – but read this first! Just which bikes can you pay for now, and earn a few quid from later? There’s plenty about, and we’ve already done the figuring out for you! Steve Webb’s stunning RG/RGV hybrid in all its glory! Want money off Pirelli/Metzeler tyres? Look no further, folks! You’re welcome! All the best gear you need in your life! Honda’s 2003 CBR600RR RCV-alike certainly looked the part, and is now a great used buy! Fuel additives. Good? Or still a load of tat? Blinking means not thinking, or seeing…! Riding like a prat? Got caught? Read this! The best guff from the best readers ever! Charlie’s TZR project continues apace! More new bikes arrive this month! Featuring Mr North West 200, Mervyn Whyte, and what the future holds for the road race! Previous Post:Join us at Castle Combe’s Motorcycle Grand National! Next Post:Suzuki RG(V) 500 & The ‘Two Stroke Story’ – Out Now!